Engineering corps from Russia, Belarus, China and Egypt demonstrated state-of-the-art equipment and showed the mastery of military forces at the 2015 International Army Games. Here are the five most popular pieces of equipment for Russia’s engineering troops. 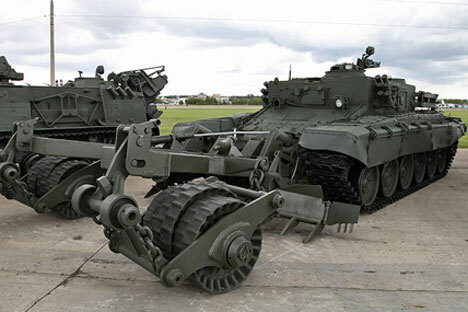 The BMR-3MA ‘Vepr’ ("Boar") mine-clearing vehicle has no analogues in the world. It searches for and defuses mines in the snow, underground and on the surface, and is equipped to deal with radio-controlled explosives. ‘Vepr’ is based on a T-90 hull and is furnished with a deck-cabin, a remote control system for mine rollers and an anti-aircraft machine gun. It can hold stocks of food, water, heaters and even a compost toilet, which allow the crew to stay on the job for three days. These first appeared in the 1970s. The modern variants are equipped with a digital mine-indexing system, which builds a complete electronic map of mines and immediately sends the coordinates to the military unit to conduct the mining. The vehicle also carries the equipment, which allows for disabling mine-arming devices. Soon, military troops will be able to activate and deactivate the mines remotely using the minesweeper's software. The all-purpose engineering vehicle IMR-2 has, as its base, the chassis of a T-72A tank. The vehicle clears the way at 12 km per hour in open terrain, and crosses 300 to 400 metres in an hour in wooded areas. The IMR-2 is operated by two persons who can live independently in the cabin for about three days. Due to the chemical protection, this is the only vehicle that can operate efficiently in high radiation. Designed for transporting military equipment, personnel and cargo across water obstacles in landing operations, the PTS-4 passed state tests in 2011. It can sustain movement for 10.5 hours on water and travel 600 kms on land, because of the extended fuel tank designed for this vehicle. The mobile vehicle can build bridge systems to cross water obstacles up to 100 metres wide and 5 metres deep. These bridges can take a load of 60 tons of equipment. Once installed, another vehicle enters the bridge and continues the installation of a new bridge (pontoon) until it reaches the shore. One person manning the control panel on the vehicle’s stern can install a flight bridge unit in around 5 minutes.